3 entries categorized "Resources: The Art of the Shim"
The first book from Bibulo.us is out! It's been a busy week. 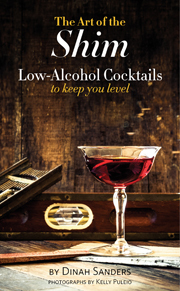 Thanks perhaps to favorable winds over the ocean, we got the surprise call from our shipper to coordinate delivery of 2000 copies of The Art of the Shim: Low-Alcohol Cocktails to Keep You Level a week early. Whee! Due to a series of mishaps denying us expected resources, Dinah unloaded all 101 boxes before assistance arrived. Yes, cocktail nerd, author, stevedore; the complete Renaissance woman. By this afternoon, books are scattering toward their future homes. Those of you ordering from bookstores or Amazon will be gratified to learn that your copies are already making their way to the distributor and thence to you. Ebooks will soon be available through multiple sources. San Franciscans, rejoice, for you can get a book into your hot, little hands right away: copies are in stock for you at The Booksmith, Cask, and Nosa Ria Market. The most fun has been delivering thank you copies to the folks who have supported the project along the way: bartenders, advisors, beta readers, cheerleaders. One month to book launch! Everything is fitting into place for the release of The Art of the Shim: Low-Alcohol Cocktails to Keep You Level in September! You can pre-order the book online and in several stores already, with more coming. The bookstore launch party will be at The Booksmith in San Francisco's Upper Haight, Monday, September 23rd at 7:30 PM. There will also be some pop-up festivities at the bars featured in the book. Keep an eye on the Bibulo.us Twitter account for announcements. Adonis, Alfonso, Amaretto Sour, Americano, Antique Sour, Apparent Sour, Backpedal, Bamboo, Ben's Good Humor, Bitter Giuseppe, Bloody Betty, Bored Stiff, Boulevardier 1934, Champagne Julep, Cherry Mixture Cocktail, Chrysanthemum, Coffee Cocktail, Devil's Cocktail, Diamond Daisy Shim, Diplomat, Dubonnet Velvet, Epiphany, Far East Side, Fino Noir, Fire-Breathing Devil, Flor de Jerez, Flying Horseman, Grasshopper, Haberdasher, The Iggy, Jeff's Whimsy Shim, Lindsey's Whimsy Shim, Lodestone, Michelada, Nopa's Grapefruit Cocktail, Pantomime Cocktail, Perfect Thyming, Pimm's Cup, Pleasant Evening, Port of Havana, Port of SF, Rhum Dandy Shim, Rose (fallen), Satan's Whiskers (curled), Sherry Cobbler, The Shortie, Silver Ruby, Sloe Gin Fizz, Snow White, Sophia Loren Shim, Spion Kop Cocktail, Spring Green, Teresa.